On a day that will be considered a highlight of his life, a 15-year-old Pakistani boy was part of the coin-toss at the Brazil vs Croatia match. Dawn.com reports that the 15-year-old Ahmed Razan hails from Sialkot and belongs to a family of craftsmen, who have been preparing hand-stitched footballs for professional leagues over three generations. According to reports in the Pakistani media, a major cola brand will be working with Oscar-winning filmmaker Sharmeen Obaid-Chinoy to produce a documentary on the boy's journey from Sialkot to St Petersburg. 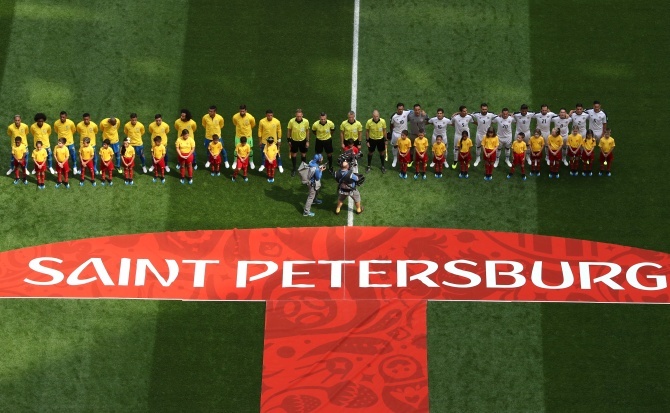 A missed flight connection in Moscow forced a group of Peruvians to pay $800 for a taxi to get to a World Cup match, communicating via Google Translate with a driver who kept on pushing up the price. The four friends were forced to take the desperate step to make it on time for Peru's first game against Denmark in Saransk, 650 km (400 miles) east of the Russian capital. "It was a 10-hour taxi with a guy from Tajikistan that doesn't speak English. That was tough," said Rodolfo Devercelli, recounting the experience a few days later in Yekaterinburg. It didn't take long for the agreed price of $600 to creep up. "After 20 minutes the guy says 'I think it's going to be too far, it's going to be $700'." Three hours from Saransk, the demand rose to $1,000 plus a tank of petrol, Devercelli said. "I say no way $1,000, it's going to be $800 and I fill your tank. So that was our experience to get to Saransk." Despite the bad start to their World Cup adventure, and the fact Peru have suffered two defeats, the friends said they were taking home an overall positive impression. On Thursday they even enjoyed a free taxi ride worth 150 roubles ($2.40). "Yesterday we had to pick up our tickets from DHL," said Joaquin Otero, another member of the group. Moscow's shops are stocking up on beer to slake the thirst of World Cup fans after some bars reported shortages. "There's beer everywhere," an Azbuka Vkusa saleswoman said. "There's nowhere to put it." International brewers report an increase in demand for the World Cup, which runs until July 15 in 11 Russian cities and have guaranteed that fans will not run out after some shortages in the first week of the event. "We are experiencing higher demand for beer in Russia, compared to a typical summer period in Russia," Anheuser-Busch InBev, the world's biggest brewer and an official FIFA sponsor for the World Cup, told Reuters in an e-mail. "We have planned and prepared for this scenario to ensure we are delivering beer to our partners in full capacity." Russian food retailer chain O'Key said that demand for beer at its stores had increased by 10 percent since June 14, when the tournament kicked off, over the same period last year. Five other Russian supermarket chains, including Azbuka Vkusa and Magnit, did not reply to questions about how they were coping with heightened beer demand, but managers of local stores said they had needed to increase stocks. "We are having to order more beer because of the World Cup," said Zinaida Fisher, the manager of a Perekrestok supermarket branch in central Moscow. "But we have enough for everybody." "The closer you go to the centre, the more you will find that beer is being bought up at a spectacular rate," said Kirill, who was not authorised to speak on behalf of the store. "Fans drop in, buy beer and leave." "Countless beers. Countless. A lot. Many. Plenty," said Hector Capistran, 40, from Mexico, when asked how much he had been drinking.